Make your log home weather-tight with Sansin. Logs move and shift like no other structure. Timber-Tec Chinkings and Sealants from Sansin are specially designed to provide the protection log homes demand. During construction, Eco-Stack is an adhesive applied between logs to protect against moisture infiltration. 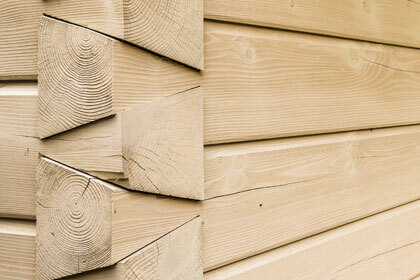 Chinking protects the spaces between your logs and helps seal your home against the weather. Seal’n Hide is a paintable zero-VOC compound designed to seal checks and cracks in bare or finished logs. Whatever the requirements of your project, Sansin has an Enviro Stain that will deliver the exceptional performance your log or timber-frame interior deserves. Scroll down for an overview of our family of interior products or get inspired by browsing the Photo Gallery below for examples of beautiful log home interior projects featuring Sansin Enviro Stains.